After some 20 years of steadfast ceramics work, Ken Ford’s artistry has evolved to a point where it is actually closing in on itself. If this statement seems obscure, so too are his latest series of sculptural pieces, which are literally obscured from the viewer by packaging, which in itself is part of the artistic process. Packaged Clay is the latest development in a career which has seen this largely undocumented but constantly active ceramic artist make innovation the essence of his practice. Residing in the alternative-thinking, environmentally conscious Northern Rivers region of the NSW far north coast for most part of the past two decades, Ford was perhaps bound to take on a thematic and philosophical approach to his work rather than adopt a fastidious preoccupation with technique, although his roots and training are founded in traditional ceramics. Nor is he inflexible in his cogitative methodology; he is not averse to utilitarian ceramics and reverts to traditionally based pottery when financial needs dictate or when he perceives a need to re-invent his artistic intent. But ultimately Ford has always tended towards the unusual, the intellectually challenging and, in tangible terms, he believes there is more creativity in sculptural pieces where there are no functional restrictions and space is his to play with in unrestrained fashion. Ford studied ceramics at the highly regarded East Sydney Technical College in 1972-73, under the guidance of the instructive elite – Peter Rushforth, Bernard Sahm, Joan Grounds, Col Levy and Diogenes Farri. His first solo show was at the Macquarie Galleries in 1976, entitled Head Pots, and was “fairly avant-garde as far as ceramics went back then”, he recalls. “At this stage the move away from traditional pottery was only happening slowly towards a more contemporary treatment of clay.” Later in the 1970’s, Ford moved into a mixed media treatment of pottery which has influenced him to this day. At this stage Ford moved to the country and went “underground”. He reflects, “It was part of the 70’s ethic to get away from the city and become self-sufficient. I began wood-firing returning to traditional roots. I had to start again because I realised most of my inspiration had come from reactions to what was happening in the cities; when I came to the country that inspiration disappeared. I had to go through a sort of metamorphosis responding to the natural beauty of the country.” But his innate propensity for the unorthodox led him towards a more abstract expressionistic style and his Australian Chinese Vases of the early 1980s saw him play with landscapes using a three dimensional form to look into a pot and out of a window simultaneously, encouraging the viewer to look into a pot to look out. In the mid 1980’s, Ford’s foray into mixing media expanded with ceramics incorporating screen printed graphic designs, pots and tiles being the main elements. But as work increased, living standards dropped and a change of scene became imperative. Ford spent some time in Tasmania and then Perth, reverting to creating lidded jars depicting local scenes such as sailing and architecture. But even there he found himself moving towards non-functional abstract forms, often with graphics on three-dimensional formats, the result being sculpture. He returned to NSW and, apart from a sojourn to France in 1992, has been settled for some time at Larnook, a village near Lismore. Ford’s latest ceramics works, such as Time Bomb, are made from a polystyrene box mould. For Ford polystyrene is “the bane of my discontent.” The mould is used to create a textured and coloured ceramic form and then, are surrounded by small pieces of textured clay signifying the release of pollutants and the ultimate deterioration of the planet. While the environmental theme was intrinsic to the piece, Ford says the intent with Time Bomb was focused on an exploration of form, texture and colour. 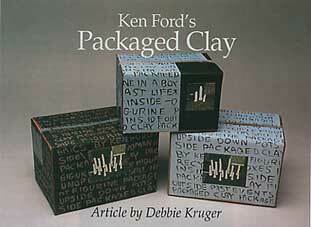 In the Packaged Clay series, Ford’s primary focus in 1994, he has reverted to smaller objects which can be acquired for neater ornamental purposes, but Ford the philosopher is not pandering to the whims of superficial art collectors. The message is as resonant as ever. The first series features three-dimensional pieces of drawing on plaster, packaged within cardboard boxes, with photographs and details of the objects fixed to the packaging. It requires a punctilious procedure to create the obscured sculptures. 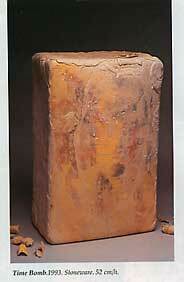 “I lay the colour slips on the mould, push the clay to turn it into a 3D shape. I am pointing back to the roots of ceramics, especially in a jug or vase while trying to find new ways of talking about clay.” In this case, the results are fine cylindrical shapes that almost necessitate having some kind of packaging to stop them from breaking. “These pieces are as fragile as much as it’s a fragile concept,” says Ford, emphasising again that the exercise is basically about form, colour and texture. Responses to Packaged Clay 11, featuring a series of 15 gender non-specific, expressionless figurines in boxes, with the boxes themselves more the focus of the artist and for the viewer. Covered in lino-block printed text which talks about the work, with references to types of packaging, and again incorporating photographs of the enclosed pieces, the progression here is on the attention to the making of the box itself. Ford acknowledges the regard for a more commercial, attractive-looking item, but has not diverged from his contentious position. While Ford spent the latter half of 1994 assembling the NSW North Coast’s finest ceramics artists for a show at the newly-opened Chocolate Factory gallery in Lismore, and is clearly committed to continuing with his environmentally-based work in that region, he has not ruled out another overseas pilgrimage to renew his inspiration and to study sculpture and printmaking. What is certain is that he will be constantly drawn to mixing his media and his metaphors, and creating objects of multi-layered significance, which will continue to challenge himself and his viewers. This entry was posted in Art, Ceramics, Sculpture. Bookmark the permalink.